Commercial shop premises with 4 bedroom flat . Shop premises comprising: Front Shop, Basement, Back Shop . Cloakrm. Workshop. 1st flr: Store rm. Apartment comprising . V/bule. Reception hall. Lounge. Dining rm. Dining kitch. Bathrm. 2 Bdrms. 2nd flr: 2 Bdrms. Price around £249,950 Entry by arr. Viewing contact solicitors. (EPC band - F). 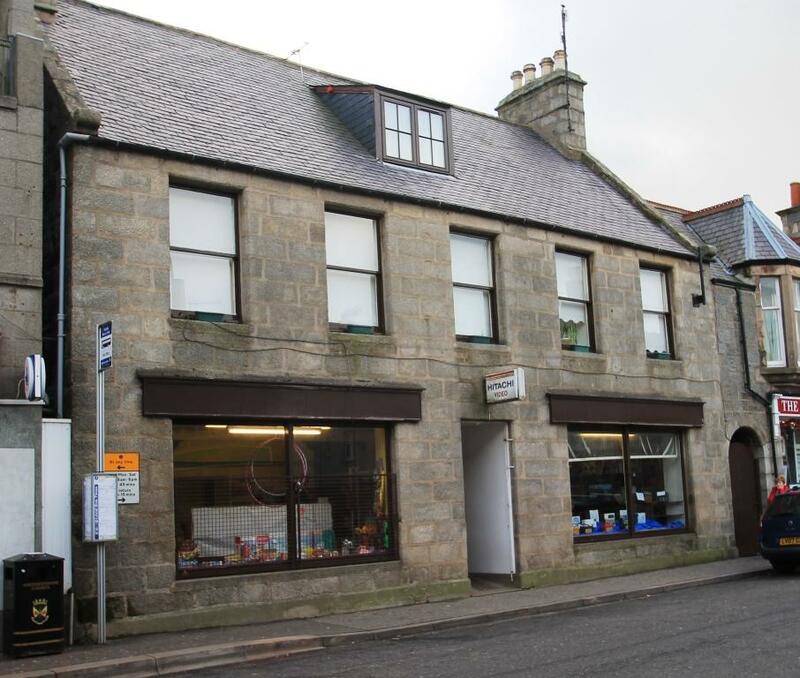 This spacious Commercial shop premises has 2 large frontage display windows on Gordon Street which is one of the main shopping streets in the town. This large magnificent property includes a spacious 4 bedroomed first and second floor apartment with an internal access door from the shop to the apartment which has retained many traditional features of cornicing, picture rails and doors. There is private rear courtyard which is set out in paving slabs, a shrub border and drying area. There is a side pedestrian access gate to the main street. The spacious family accommodation has been thoughtfully arranged throughout and the whole property would be ideal for running any type of business. Huntly is a busy north east town with a population of just over 4,000, situated on the main road and rail route between “The Granite City” of Aberdeen and Inverness. Huntly has various leisure amenities including swimming pool, 18 hole golf course, bowling green, cricket ground, and Nordic Ski centre. As well as a wide variety of shopping facilities there are two new supermarkets. The town also has a Health Centre and hospital. Secondary education is available at the well-known Gordon Schools. Nursery facilities are also available. SHOP PREMISES 18 – 20 GORDON STREET Offered for sale is the building only and does not include the business of television engineer, it is being sold as a non trading business. FRONT SHOP 24’ 5” x 14’ 6” (7.44m x 4.42m) Entrance door to front shop with large display window; counter and office area; archway leading to a further department with a large display window; cupboard; multiple TV aerial points; small door to basement; door to apartment; door leading to back shop. BASEMENT Steps leading to storage basement which runs the whole length of the shop with light. BACK SHOP 28’ 6” x 12’ 9” (8.69m x 3.89m) Door leading to workshop; stairway to first floor. REAR HALL Toilet with wash hand basin; water meter. WORKSHOP 19’ 4” x 14’ 6” (5.89m x 4.42m) Workbenches; multiple sockets; multiple TV aerial points; telephone point. GENERAL Electric heating Ample power points Multiple TV aerial points. VESTIBULE Internal access door from shop. External access door to Courtyard. Inner stairway leading to first floor accommodation. RECEPTION HALL Large window providing natural light on the stairway leading to the hall which provides access to first floor accommodation; stairway leading to second floor accommodation. LOUNGE 16’ 1” x 13’ 3” (4.90m x 4.o4m) Feature stone fire surround with inset real flame gas fire; display alcove with glass frontage and cupboard; TV aerial point; 2 large front facing windows. DINING ROOM 13’ 2” x 13’ 1” (4.01m x 3.99m) Fire surround. DINING KITCHEN 11 ’5” x 9 ’ 7” (3.48m x 2.92m) Fully fitted kitchen with ample wall and base units; tiling around work surfaces; plumbing for automatic washing machine; electric hob and oven; gas boiler; space for fridge freezer; eyeball ceiling lights; door to walk in pantry. BATHROOM 3 piece suite comprising large enamel bath, wash hand basin and toilet; towel rail; storage cupboard; window. BEDROOM 1 10’ 9” x 9’ 10” Double bedroom; rear facing window. BEDROOM 2 9’ 3” x 7’ 8” ( 2.82m x 2.34m) Double bedroom; front facing window. HALL Providing access to accommodation; access to loft; skylight window. BEDROOM 3 13’ 6” x 10’ 5” (4.11m x 3.18m) Double bedroom; combed ceiling. BEDROOM 4 13’ 6” x 11’ 6” (4.11m x 3.51m) Double bedroom; combed ceiling. OUTSIDE The rear enclosed courtyard provides a tranquil seating area or for alfresco dining and is set out in paving slabs. Pedestrian gate leading to the main road. GENERAL Gas central heating. Double glazing. TV aerial points. Telephone points. Ample power points. Mains water. Mains drainage. HOME REPORT EXEMPTION This property is exempt from a Home Report as it is a “Mixed Sale”. A home sold with one or more non-residential properties (flat above a shop) is exempt as the seller will not consider an offer to buy the home separately from the shop.